Our school spring musical program was last week. Simon is checking is watch, anxiously awaiting the start of the show. Sure, ’twas a grand St. Patrick’s Day! Fr. McKenna remarked that there is always something special about March 17, but this year it seemed especially so; in church and outside: the beautifully decorated shrine, the shamrocks, the beloved minor key hymns… And then Helfta Hall made Irish for the day, all in green, even the donuts, and shamrocks galore, each preaching the Blessed Trinity. 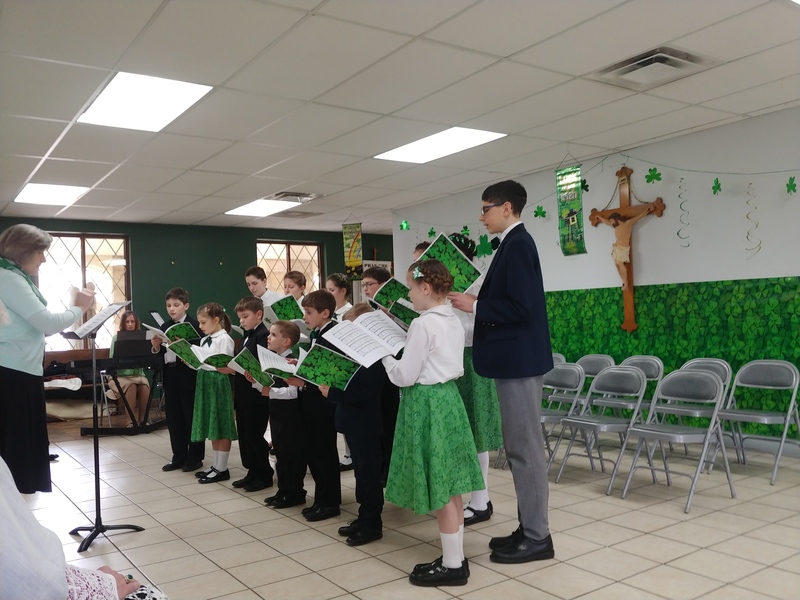 The welcoming hall was packed for between the Masses and for the ever so charming school program “Shillelaghs and Shamrocks,” with one beautiful tune after another, so touchingly sung by the children. Some of us were able to stay to thank God for the day by singing the Vespers, but it was not over yet. 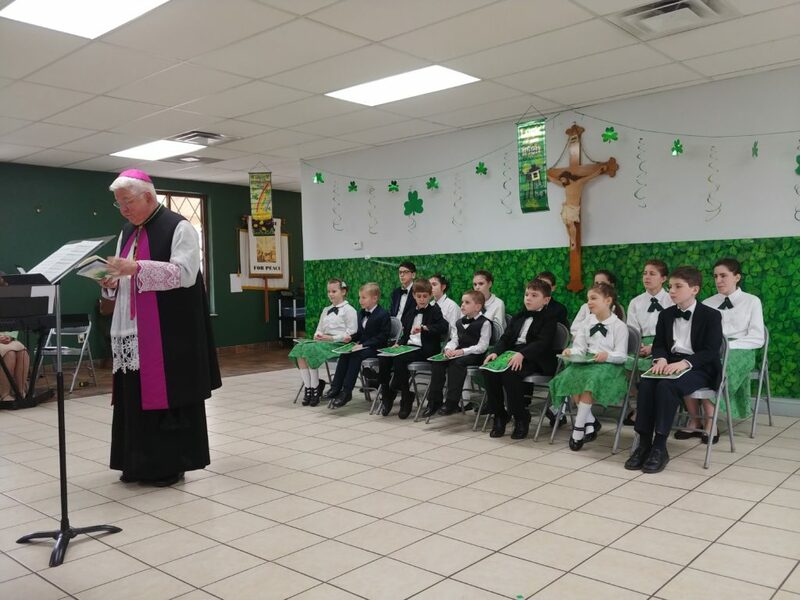 An excellent attendance of late for the 5:45 permitted more souls to hear the “Mass of the Irish.” It was this Mass, our Mass, for which the children of St. Patrick suffered for four long centuries, and which sustained them when reduced to serfdom and virtual slavery. Only two days later came good St. Joseph, great St. Joseph. His altar has been gleaming golden with Spring flowers all March. Illness prevented a Solemn High Mass, however the surviving Fathers ably assisted me at the altar. But they were not the only ones. 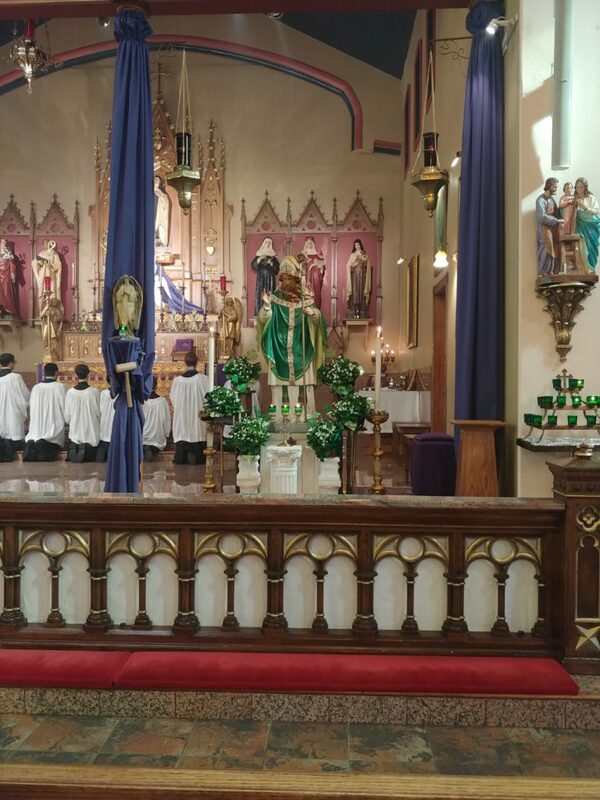 Fully 1/3 of our parish made it to Mass, ably assisting the priest at the “miracle of the altar,” thus honoring the “Father and Guardian of Jesus,” great St. Joseph. What a wonderful act of devotion. Surely Heaven heard. They say the best Lent is made up of the sacrifices God sends to us, not those of our own choosing. In that case, I think we’re all having an excellent Lent, for the Lord is both giving and taking away. In addition to the ever difficult weather, Winter into Spring, and maybe as its byproduct, God has sent us cold, allergies, sore throats and bronchitis and that vague “something going around.” Blessed be God. But the “take aways” stand out this Lent. We have lost (in no particular order) voices, heating in the school, and the church bell. Oh, and I lost my cat, Caravaggio, and part of a front tooth. The voices are returning, and the school heat seems to be working again, after another cold few days. But the cat I fear is gone for good, and our church bell remains a mystery. The French used to tell their children the bells went to Rome on Holy Thursday, to return on Holy Saturday, but it’s too early for that. It seems the mounting of the bell was damaged during the installation of the new H/Vac unit on the church roof, and then the whole apparatus was destroyed, pending perhaps some potential future roof repair. Or not. Please pray with me to St. Agatha for its restoration. In the meantime I had a bad fall the other day in the parking lot as I was saying my Rosary. Deep in thought, I walked off the asphalt! I lost some tooth in the process, and gained a bruise or two. But the dentist kindly patched my teeth, and removed some asphalt, which had decided to adhere. The rest of me will heal in due time. God’s Holy Will. Well, those are the ups and downs of a week at St. Gertrude the Great. 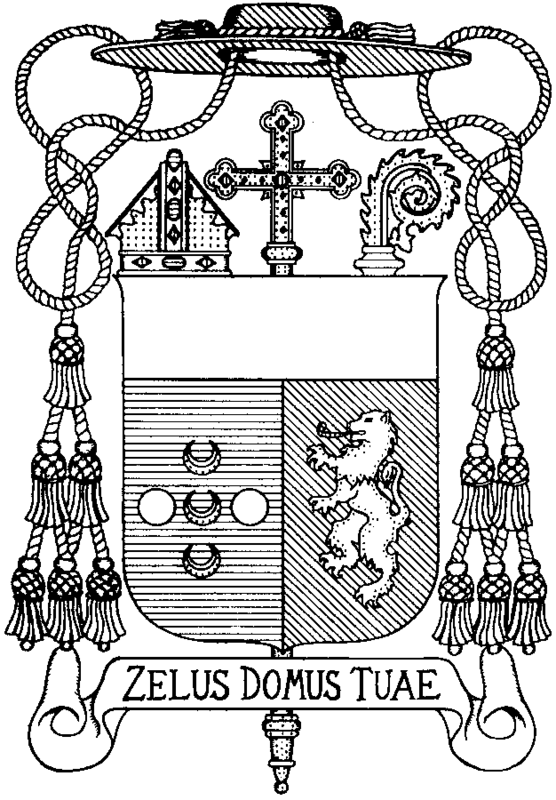 Our Lenten Masses and devotions continue strong, and I hope you do as well! Remember our Morning of Recollection next Saturday, and the Sisters on Sunday. Tomorrow is the third and last of our great Lenten feasts, the Annunciation. A special Mass will be sung, and Vespers before the Blessed Sacrament Exposed. Can you help us pray? Since the Democrats and State Legislatures are so intent on slaying now even babies after birth, we can only cry out all the more fervently for a good and just God to spare them, and us. You know now that the Holy Eucharist, atoning Sacrifice and abiding Sacrament, is the infinitely powerful way to do this. It is our bounden duty. May the Mass, “God’s Gift, Man’s Duty and Satan’s Theft” be foremost in your thoughts and prayers this Lent. I send a blessing home with you. This entry was posted on Saturday, March 23rd, 2019 at 3:50 pm	and is filed under Announcements.